Probably one of the biggest tourist attractions in Denmark. Legoland Park in Billund opened on June 7th, 1968. The theme park is placed not far from the actual Lego factory. Billund Airport, camping and Hotel are right next to the theme park. Over 45 million tiny lego blocks have been used to build the theme park, portraying scenes from all over Denmark and the rest of the world, such as townships from Sweden and Holland, Amalienborg Palace, NASA Space station and a lot of other places and buildings. There are also plenty of rides in the park both for adults and children alike. Everything in the park is constructed out of Lego blocks; you’ll walk past cities built in small scale, not to mention castles, airports and even famous people like Hans Christian Andersen, all built in Lego blocks. Food at The Theme Park. You're allowed to bring your own food into the park but there are countless (although a bit expensive) food stands and cafes. At Legoland you’ll find rides for young and old and even a traffic school for kids and most of the rides are included in the entry price. 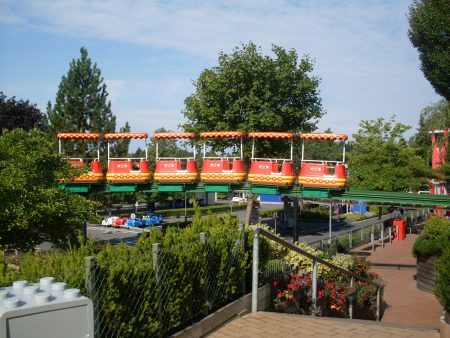 Legoland opened a new ride the last Saturday in April 2012, it is the world’s first ride with a drop of 5 meters. The Polar X-plorer has a length of 499 metres and is a real family ride. The ride lasts just under 2 min. If you don’t want to queue up too long for the rides, arrive early just when they open and go for all the rides first and then walk around and take a look at the rest of the park after. The largest Lego Shop in the World. 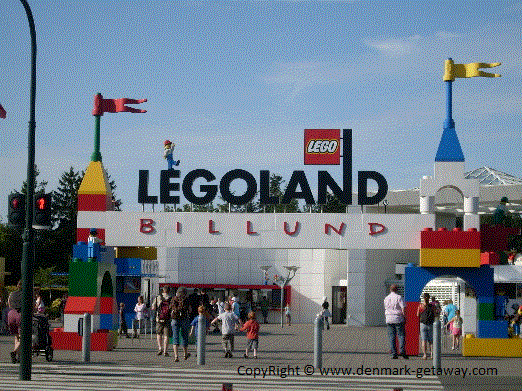 At Legoland Billund you will find the largest Lego Shop in the World. 1000 m2 of Lego bricks small or large in all kinds of colours, small Lego people, Lego games, mini tyres and wheels, yes anything Lego you will find here. SEE ALSO: ACCOMMODATION NEAR THE PARK. Legoland California resort. They offer the first Legoland Waterpark, opening June 2010. This website offers great tips on all the Southern California theme parks and things to do in San Diego California. Today Lego is not only Lego blocks and theme parks for kids. Some of their new inventions arerobots you can build with legoblocks and program with your PC or laptop to do heaps of things. 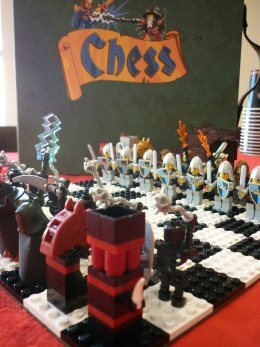 There are also board games made from Lego like the chess board. 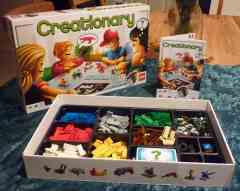 Lego Creationary, where you instead of drawing, have to build the clues with Lego blocks and the other players have to guess what it is. This game is for 3 to 8 players and from 7 years and up. The game takes about 1 hour to get through. The LEGO Minotaurus is a new and a lot more active version of the very well known LUDO game. The game is set in a maze, built with Lego blocks of course, and the task is to get your 3 heroes into the centre of the board, which the feared Minotaurus is protecting. During the game you can move the walls in the maze to offset your opponents. If you roll a black on the die you can use Minotaurus to knock home your opponents, he is walking around on the board threatening all the players, but he can also be a help to you. Lego Minotaurus is for 2-4 players. From 7 years and up. Of course this game is for Harry Potter fans, it is set in the magic universe at the Hogwarts School for Witchcraft and Wizardry. The game is a classic setup where you move around on the board and collect four homework subjects before you return to your room. During the game the Harry Potter Hogwarts board changes. The game is for 2 -4 players from 8 years and up. A game takes about 35 – 45 min. Burns Brick Country If you are interested in Lego Blogs and other lego-like building systems,then visit Burns Brick Country. Our country is all about lego and other similar brick building systems throughout the world. 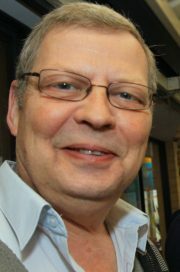 We will do our best to tell you all about lego and lego-like building systems. For toys, computer hardware & more with international shipping see Rctoysshop. Billund camping only 500 meters from Legoland. Billund Airport Denmark's second largest airport.